The TODAY Show aired Matt Lauer‘s pre-recorded interview with Brian Williams on Friday morning, and it was… awkward. 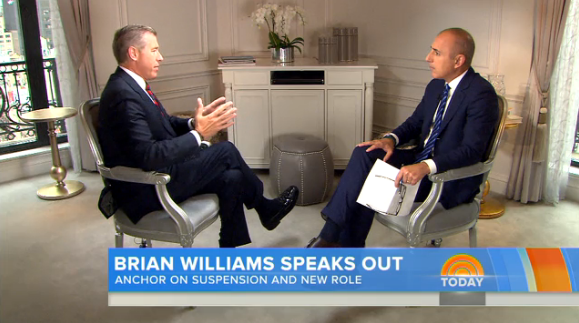 Lauer repeated pushed his network colleague for straight answers, but Williams wouldn’t budge. I mean, he did answer Lauer’s question(s) about the infamous helicopter crash story, but Williams was unable to simply admit that he’d knowingly lied. As you can imagine, Twitter had a field day with the interview. Wow, Matt Lauer is not letting Brian Williams off easy in this interview. This interview is not making Brian Williams look any better. Brian Williams interview just now on Today. What a joke. I would like this Brian Williams/Matt Lauer interview a lot more if it was live. Too fabricated – answers too rehearsed. Not sincere enough. Watching the Brian Williams interview. I don’t think he’s helping himself. Seems apologetic but I’m not feeling the 100% accountability. This Brian Williams interview is painful. Not because it’s bad…but because I’m not quite sure Brian gets it. This Brian Williams interview is brutal. How hard is it to say you lied?